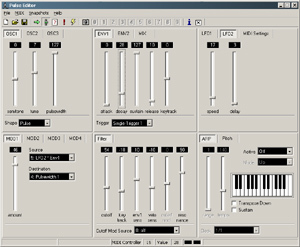 With this editor you can control all the parameters of the Waldorf Pulse. You can also load and save SysEx files. 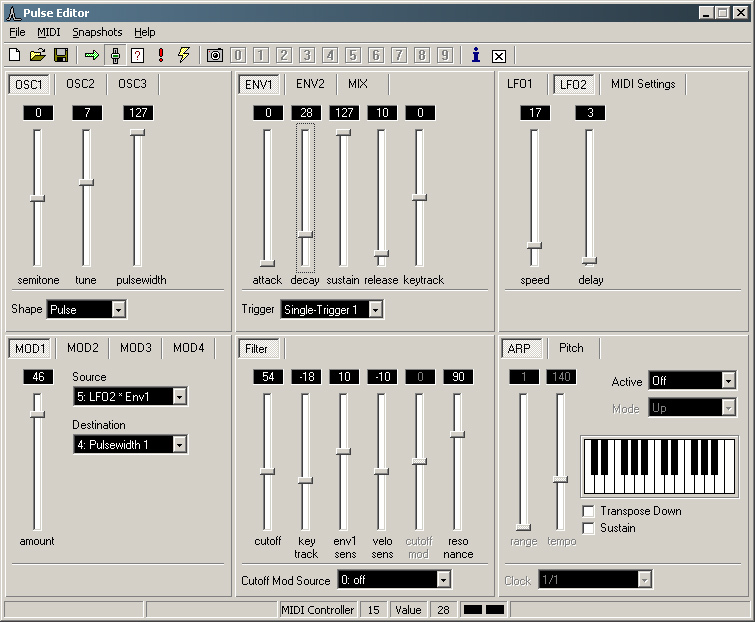 The program has 10 snapshot locations and a MIDI keyboard to trigger notes. There are two MIDI input ports, one for your keyboard (MIDI thru can be switched on and off) and one for the Pulse (no MIDI echo). The program can send a controller dump request to the Pulse. If the program receives MIDI controller data from the Pulse it will automatically update all sliders and menus. The status bar shows which MIDI controllers are send to the Pulse. There are also two LED's that indicate MIDI in/out activity and there is a SysEx viewer which shows the SysEx string. Enjoy this freeware Pulse Editor.